Most of the amenities that we take for granted require some form of power to operate and seeing as our goal is to live primarily at anchor we need to be self sufficient. 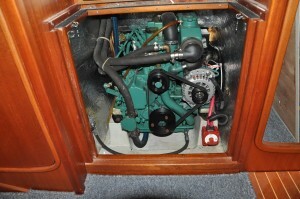 As with most sailboats of a similar size to ours we have 2 electrical systems. The 120V AC that we have access to when we plug in at the dock, and the 12V DC system powered off the batteries for when we are not on the dock. For us the AC system is very basic when we are plugged in. We have 3 plugs throughout the boat, a battery charger, and the water heater is electric/engine heat, so we also have hot water when plugged in. We do not have air conditioning and our fridge and lights are always powered by the 12V system. 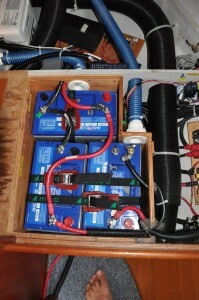 Once we leave the dock we only have our 12V system powered by our batteries. 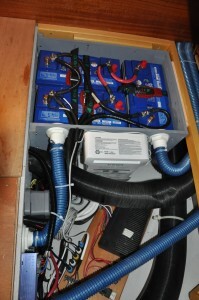 We did add a 1000W pure sine wave inverter so that we can charge our computers and run a small hand vacuum to keep the boat clean. The inverter is also nice as we can use a small toaster which is much quicker than using the stove. I know some people use theirs for a coffee maker as well, but we opted for a stove top coffee maker instead. 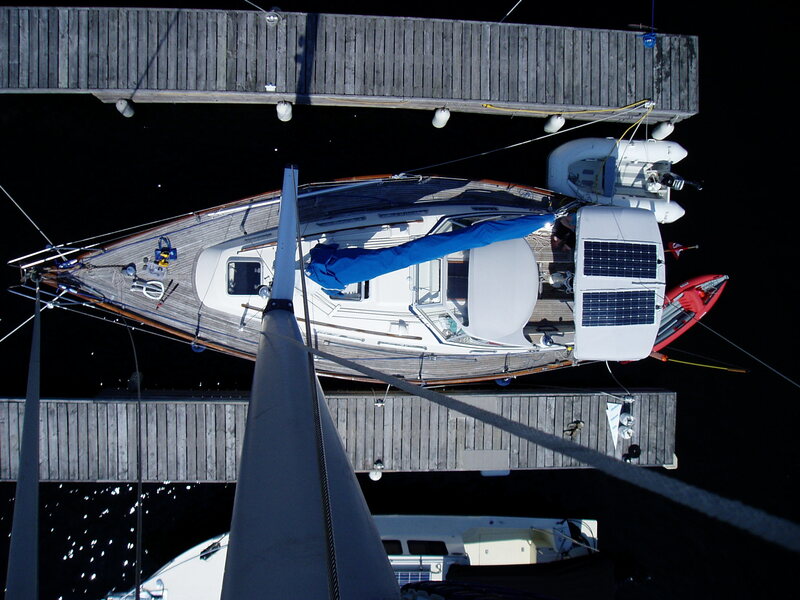 Most sailboats are day sailed or just out for weekends, so power isn’t a big issue. Over the weekend the batteries slowly drain down and the shore power charges them back up while the owners are at work all week. As few sailboats see the use that we are planning, their charging systems for the batteries typically are a single underpowered alternator. Ours was no exception. We had a stock 60 amp alternator that after running for about 2 minutes would heat up and put out a steady 28 amps. Using the stock alternator we would have to run the engine for 2.85 hours to produce 80 Ah or 1 kWhr of power. Fortunately we don’t use the same amount of power on the boat as we did at home. At anchor to keep the fridge cold and the lights on in the evening we need about 30-40 Ah per day. Any other luxuries add to this, and when we are sailing and power up the navigation equipment our usage goes up very quickly. So, I put my engineering background to good use and put together a spreadsheet to look at different scenarios for usage and generating options. 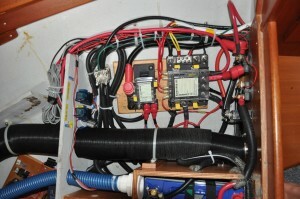 The first finding was that a high output marine alternator that could run near its rating for a long time would more than pay for itself if we lived on the boat for a year off the grid. So the shiny silver 140A Electromaxx alternator was chosen as they offered a serpentine belt kit for our specific engine . We needed a serpentine belt because the stock 3/8″ V-belt could only pull about a 70 or 80 amp alternator before the belt would wear rapidily or slip and I didn’t want the hassles of trying to make a double belts system work, mostly because they don’t work well. The alternator is controlled by a programmable Balmar regulator that allows custom charging profiles to be made to suit the specific battery capacity and type. This allows a higher charging voltage to be used to drive in the charge when the batteries are depleted and then it will taper off per the program to a lower float voltage so that the batteries don’t get cooked if you motor through the night due to no winds. 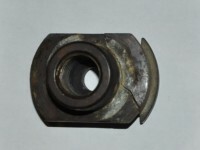 To prevent damage to the alternator the regulator also has a temperature sensor on the alternator that will cut output if it gets too hot and likewise another sensor on the batteries to prevent overheating them. I spent a few hours figuring out the charging profiles required and just have one parameter left to tweak, but I need to discharge the batteries first to see how it works. 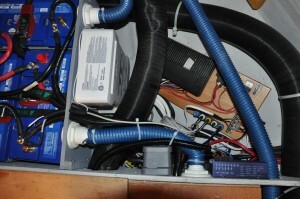 With this system our cost per amp hour will be about 1/4 of what it was before. 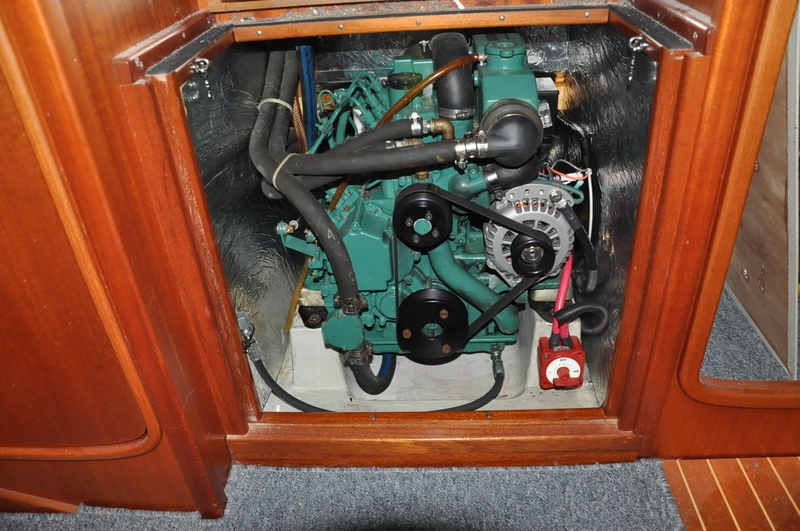 Seeing as we motor every few days to get in and out of anchorages, we will hopefully make the bulk of our power when we are motoring anyway, rather than having to run the engine solely for making power. In my calculations, either solar or an alternator would pay for themselves, but it was diminished savings by having both based on our estimated power usage. But, nothing in life is really that simple, so there were a few factors in our decision. 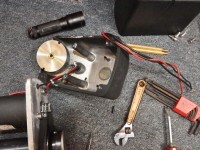 First, if we had only done solar power and underestimated our power draw in my spreadsheet, we would have had to use the stock alternator to produce the balance which would have put a lot of use on the engine. Second, if we did a multiday non-stop sailing trip and needed to run the high power draw equipment like the radar and the autopilot, we could draw between 200 and 250 Ah a day. Our solar on a good sunny and long summer day can do about 60 Ah. 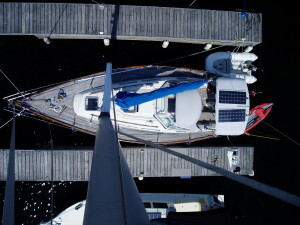 Good at anchor, but if we used 200 Ah in one day while sailing, we would have to run the engine 5 hours to recharge. That is a lot of fuel to dedicate to electricity for any sort of passage. While we could have squeezed a bit more solar on, 4x more was not going to fit. The third reason for solar are that batteries like to get fully recharged as often as possible or their lifespan suffers drastically, and solar is a great trickle charger so the cost of panels would be offset by longer battery life. Finally, we felt the solar would be a good addition to have some redundancy in charging systems, which already paid off by allowing us to get away for 10 days when we didn’t want to run the engine unnecessarily to avoid damaging our transmission which was drawing in water. 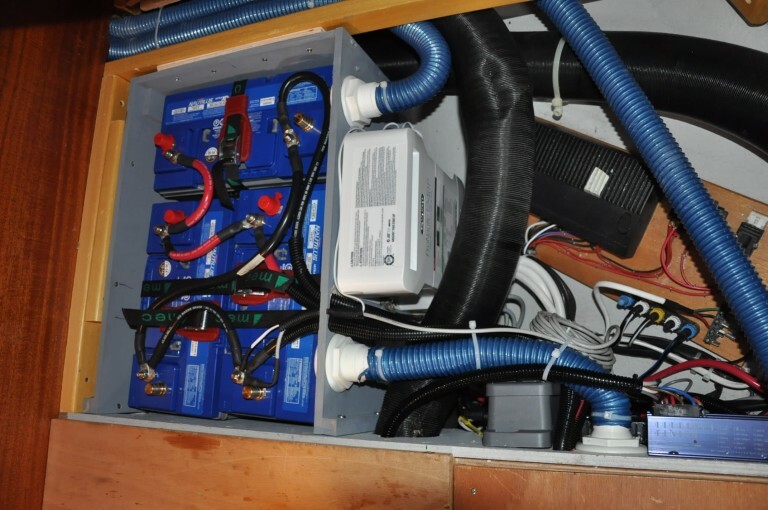 Batteries are a vital part of the system to store the power produced and there are many differing views on what type of deep cycle battery to get. We ended up installing a thin plate pure lead AGM battery instead of the traditional deep cycle wet cell batteries for a few reasons. The first was that they charge more efficiently losing only about 7 or 8% of the incoming power as compared to 20%. In theory this could more than offset their initial purchase price, but this will be nearly impossible to confirm over the long run. The other benefit is they can take much higher charging rates than a lot of other batteries even when they are nearly charged, so we can get maximum benefit anytime the engine is running. The downside, is AGM batteries can die prematurely if they don’t get fully recharged regularly, so we will have to ensure we do this weekly which should be quite manageable on a sunny day with the solar panels. 3 Group 24 marine batteries. 2 deep cycle for the house loads, and one independent start battery for the engine. Those batteries only have a 75 Ah capacity each for a whopping total of 150. But you should never discharge a deep cycle below half of its capacity or it will not last very long so with fully charged batteries, I couldn’t even go sailing through the night if I need to run the radar in addition to the navigation lights and the rest of the instruments. So, I spent a lot of time trying to figure out how to fit as many batteries as I could. By moving several things around I was able to build the box below which contains 3 Group 31 batteries each with 100 Ah capacity. By adding these to the house system, I tripled our capacity. Now we can go 24 hours running all the electronics, radar and even the autopilot for a few hours, before we have to start the engine to charge. In normal conditions we can hopefully go even longer. And now at anchor we can now go 3 to 5 days even without the solar. Batteries are also heavy and need to be secured, so I added some heavy nylon straps to the old battery box as well as my new one to ensure the batteries can’t move around. Here is a close up that actually makes things look more spacious than they are. 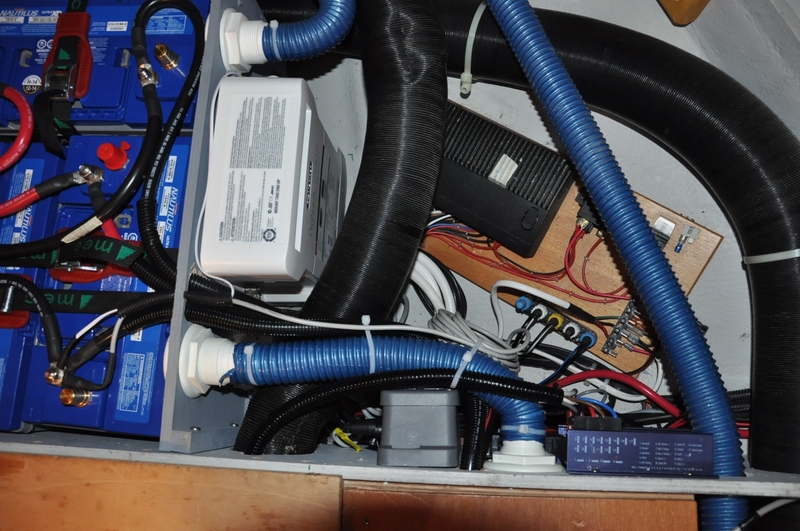 The old battery charger had died and was pulled out to make room for the battery box, the ventilation ducts needed some repositioning, the water heater line from the engine (not shown) had to be rerouted as well. Then the new charger (white box) was squeezed in with about 3/4″ vertical clearance, while the rear bottom corners of the battery box are about 1/4″ off the hull. In there is also the alternator regulator and the special echo charger to charge the start battery to keep it separate from the main house load battery bank. and the autopilot controller is buried in there as well, along with some additional networking hubs. To handle the extra amps that the batteries can deliver and additional wires for all the regulators and chargers and the inverter, a lot of fusing needed to be done. 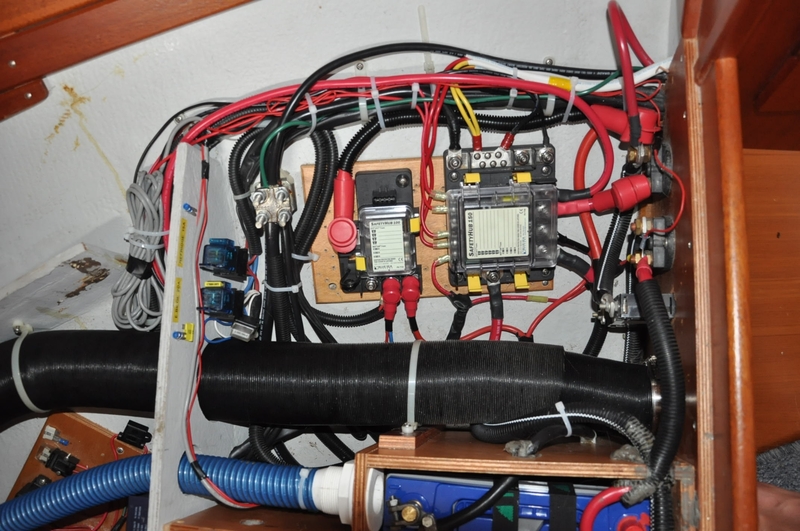 Some people have a mess of spaghetti wiring on their batteries to do all this, but I felt 2 distribution hubs would make for a much tidier installation than many of the boats we looked at, and everything is fused to the appropriate marine standards in a central location. So far, everything is working well, and with any luck it will stay that way. Blessing in Disguise or just Bad Luck? Nice job explaining the rationale behind your decisions. Hopefully you’ll follow up later after some real use and let us know how accurate your predictions are. As we give the system a good test I will certainly post about what has worked and what hasn’t and longer term which equipment has been durable for our use as I know I struggled to find what I felt was relevant data when I was making my decisions. We are from the sailboat Nine Lives, and was located at the very end slip of the 300 run of our marina. We have been researching closely at the serpentine belt upgrade ourselves, since our current system is a little weak for our heavy cruising lifestyle. I only wished we had more time to get acquainted and would have been extremely interested in having a closer look at your upgraded electrical system, and belting system. Keep us posted on it’s results. Also, best wishes on your travels. We may see you along the Intercoastal as we frequent those waters between Charleston SC and Beaufort SC during Feb and March. Just keep in mind the “ditch” can be shallow between the North and South Edisto rivers. It maybe best to move through during the high tide cycles. Enjoy the trip! So far the serpentine belt is running great. We have a little over 150 hours on it and the belt looks like new. One of the biggest benefits is that I don’t have to put any extra tension on the belt as compared with the little stock v-belt so hopefully I’m not adding any extra loads to the waterpump or crankshaft bearings that could otherwise lead to expensive repairs. The alternator seems to be working as advertised. Last summer with our old small house bank the default program on the balmar regulator worked great and we didn’t need to run the engine specifically for charging, other than starting it about 10 minutes before we were ready to go. Now that I have upsized the battery bank, I’ve been customizing the regulator program specific to the batteries and to prevent it from throttling the alternator down too early. I think I have it now, but I need another overnight sail to draw the batteries down enough followed by a need to run the engine for a couple hours. If you have any questions, don’t hesitate to ask. We should have a couple of months of mostly off grid living by the time the boat show specials roll around so I’ll know how well the system is working by then. I own number 360 (Auklet) and wanted to thank you for all the information that you’ve posted. I’ve enjoyed it and learned a lot besides. I am in the midst of upgrading the power system like you’ve done. You’ve brought some solutions and clarity to my plan including building out another battery compartment and swapping out group 24s for group 31s (had thought the existing box wouldnt accommodate the extra length). Wondering how it all worked out and what you like best/found the most beneficial vs what you could have done without or would change? I’m about to move from a marina to cruising and living on the hook. I’ve been meaning to update how the electrical worked out but haven’t gotten around to it. In general very well for our purposes. I’ll send you an email with some details incase you have questions. Best of luck with the upgrades and enjoy the cruising.